So, I am non-essential as determined by the federal government, and I have been on furlough for the past week. It was supposed to be my paid vacation time, but paid time off is an obligation to the government, so since the "discretionary" agencies have no budget, I am on furlough, not vacation. Following so far? It seems like the average American doesn't care much about a partial shutdown. Most national parks are still open and so are the forests. I've seen people giddy with the realization they don't need to pay an entrance fee. Right now the only people working in my agency are law enforcement, firefighters (if it's fire season there) and the few that are contractor representatives. Which makes me wonder. : if most of us, the toilet cleaners, the trail builders, the planners, the water testers, are not essential, maybe the parks and forests should revert back to wilderness, with no services. But I am essential in the cosmic sense. That's all that really matters. Anyway. I haven't had this many days off in a row when I haven't been on a hike. And what I have discovered is what those who are able to avoid work have known for years: Time! So much time! 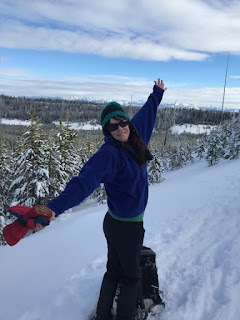 I've been able to snowshoe and ski with friends who have no work limitations, when usually I have to beg off with a sigh if it's during the work week. I also realize: I would be in such great shape if I had this much time, all the time! And we have been blessed by soft, fluffy powder snow! The kind that your snowshoes sink in deep, the kind that forgives your clumsy skiing. The dog is getting spoiled too by all this activity. 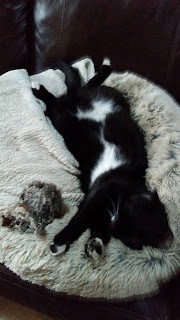 No more lying sullenly in the house while I work. It's play time all the time! This makes me realize why some less fearful friends retired early, with the opinion that the future is not guaranteed. I get it! But I still can't quite make the leap. There's been too much time invested, and so little to go. I do dream, though. ***Speaking as a private individual. These opinions are not expressed for my agency, or on official work time, or in my professional capacity. I desperately snowplowed down the steep slope. Oh no! Obstacle! Obstacle! A fallen tree loomed ahead. 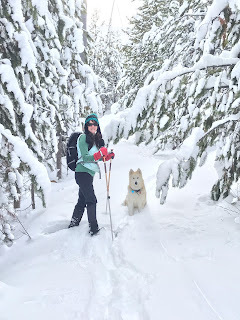 For Pete's sake, what was so easy about cross country skiing? Dang! An obstacle on a hill. Trust me, this may not look like a hill. But it is. Despite this being a dismal winter in the valley, I was gratified to find plenty of snow up high. Accompanied by my friend T and a little yipper named Molly, I ventured out to the trails to see if I remembered how to ski. Turns out, I do, sort of. She's little, and she tends to yap a lot, but she's cute. Not a great photo because she wouldn't stay still. The next day I went out solo to check conditions on the Canal Road. This is a summer road that is only open to oversnow vehicles in the winter. As you may surmise, it parallels a canal. You can travel ten miles one way, but I didn't have time for that. Darkness began to fall and it was time to retreat. Conditions were fine, once I avoided the tire tracks (the memo about driving on the road in winter must have been lost to some). The dogs were pretty happy about the two hour ski. So was I. The third day I had a couple of hours to spare between work obligations. I returned to the Canal Road, but took the skier trail down through the forest. This is a route I can only undertake when there is plenty of soft snow to slow me down--it's quite the elevation drop. Today there was just enough snow for it to work. I only had to sidestep down two very steep hills, and never sunk to the low of hiking with skis. 2. I may have had a meltdown on my birthday one year on a "most difficult" route. Thus the new saying by J: "it's not your birthday if there's not a meltdown". 3. I have uttered "oh no, oh no, oh no," more than once. 4. I have walked quite a few hills. 5. I once fell over a dog when I couldn't stop in time. 6. I'm always grateful when I get back to the car with all limbs intact. 7. I am secretly glad when it is a slog rather than extremely fast downhill. 8. I'll ski up the Hill of Terror to avoid skiing down it on the Summit Divide loop. 9. My attempt at skijoring ended in disaster when the dogs ran too fast for me. 10. I once fell over when standing still on cross country skis talking to a friend. J stared in amazement as I tapped on the keyboard. "How can you even make a flight reservation for MAY?" he asked, horrified. He is from the Wing It school of adventure. He doesn't even start packing until the day he leaves, something that horrifies me. In contrast, I start building a pile of gear at least a week in advance. Then I revisit it, taking stuff out, adding stuff in. Invariably the forecast will change, leading to panic packing the night before. I am guessing this approach isn't much better. Getting ready for Washington PCT, circa 2013. I'm working on my last two PCT section planning. It is amazingly complicated when you are hiking between two 200 mile points. For one, the most efficient way to do it is buy two one way tickets, one to one town and the second from another. You have to calculate how many miles you will hike in order to meet the departing flight, hoping that a trail angel will appear to take you past some miles you already hiked. You have to mail a box of clean clothes to the last town so that you don't offend your fellow plane passengers. You have to figure out where you will resupply and when you might get there (I tend to go 100 miles between resupplies). For the last section, in the Southern Sierra, you roll the dice on a lower snow year and hope it will be accessible in June. I don't think I bring this much stuff anymore. For one, I have ditched the sleeping bag stuff sack and now pack the bag loosely in the bottom of the pack. I've downloaded maps and studied them. I won't go as far as some infamous former Sierra trail partners who made spreadsheets of where camp would be every night. Going solo gives me a lot more freedom. But still, there are some parameters. I have to hike 20 miles a day, pretty much. I need to figure out where the big water carries are and to bring enough capacity to deal with those. I need to invite some trail friends to Horseshoe meadow to PAR-TAY at the very end ("party" being a relative term and probably consisting of cookies and maybe a toast). I must start planning now! 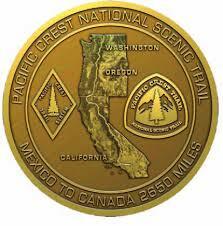 PCT completion medal. They put your "trail name" on the back. Can't wait to get one of these! It's good to have something to do right now. A promising winter has given way to a glum not enough snow/too much ice situation. Adventures have been limited. The treadmill even made an appearance. My neighbor appeared from two weeks in Hawaii and looked depressed, like he wanted to go right back. That didn't sound all that bad, actually. Monkey Bars and Flash, finishing Washington! It'll change. It always does. We just need to wait it out. In the meantime, I'll plan. May will come pretty fast. 2. If you have to get workout clothes because your suitcase is lost and you NEED to exercise, a 24 hour Walmart in Hattiesburg, Mississippi may not be the best place to go. 3. You are never too old to be creepily checked out by scary looking dudes in Walmart. 4. If you hear a large amount of air coming out of a tire at 4 in the morning at the airport, and you are one hundred miles from home, and your flight leaves in an hour, there is nothing you can do but go inside the airport. 5. Les Schwab tire shop is awesome. 6. Mississippians are the nicest people on the planet. 7. Southern accents are very appealing. 7. Missisippians are also some of the most unhealthy. Y'all, you need to move a little more. 8. Maybe because if you order seasonal vegetables, you will get onions and zucchini drenched in oil even though you have asked for steamed. 8. It is entirely possible to sprint through the Houston airport and get to a connecting flight in 20 minutes. 9. Even in a really built up area, you can usually find something pretty. Such was the case with Black Creek. We hauled our sit-on-top kayaks to the river at Cypress Landing (one of several access points). Only twenty-one miles of the river are designated Wild and Scenic, and we only had time to float six miles. There were rumors of alligators and cottonmouths, but it seemed too cold for that. Nobody floats the river in December, except us, so it was quiet except for our conversation and the sound of our paddles. The water was tinged a deep brown from tannic acid. You didn't even really have to paddle. 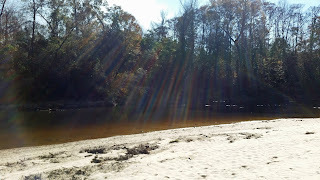 The current moved along at a brisk two miles an hour, and you could float along, just using the paddle to avoid some of the trees and sandbars blocking the creek. The vegetation along the streambank bent over like a canopy, making it seem completely isolated from the rest of the world. At one sandbar we got out and hiked some of the Black Creek national recreation trail. Stretching 41 miles and often touching the river, the trail looks wild and abandoned. Without a lot of topography to make a difference, it looks to be a fairly easy stroll and a super easy thru hike to add to the resume. Black Creek National Recreation Trail. It doesn't look very used. The breadth of the sandbars varies with water flow, and we were floating through at a lower level. The "lunch sandbar" was so wide and warm that I wished we had brought a tent (a common theme of mine). Warm sand in December: it was like a dream, considering that at home, it was well below zero. On this stretch, three pipelines run beneath the river, from one side to the other, a reminder that humans have messed with just about every inch of the planet. Except for those and a bridge, we saw no development until, three hours later, we reached Fairley Bridge landing, our takeout point. It was hardly a strenuous outing. "The rednecks put in tubes and float down," one of the forest employees told me. It sounded kind of fun in the summer, except for the aforementioned alligators. In the summer, they explained, you would never want to hike the trail, though. Too many bugs, and way too hot. On the river, you would spend most of your time swimming, not paddling. I'm not into a place where the summer is off limits for outdoor fun. But paddling in December? That I could get behind. I'm already scheming a return to backpack the trail. It was not even by design that I didn't bring skis also, because I thought there was no way there would be enough snow to ski. However, there was. I settled for snowshoeing, the first time this year. It was a good choice, even if I only had an hour. And a couple of days prior, I arrived at the East Fork ready for a hike, only to discover it would have been great for running. In previous lifetimes, the only activity I really did with regularity was run. I ran six days a week. I don't miss those days. I think a diversity of interests is way better for my body and for keeping my interest up (and making me more interesting). So as usual, my adventures are gradually shifting from hiking to everything else. Even though I miss hiking, I know that it is good to take a break from any one thing for a period of time. This year will be the year of more skating. Of skiing down the Hill of Terror (recently downgraded from the Hill of Death). 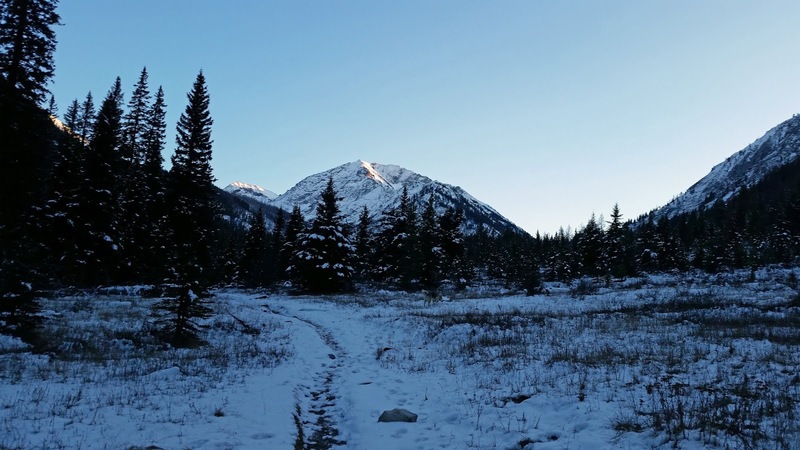 Of more snowshoe loops, and some winter runs. I'm actually sort of looking forward to a hiking break. When you do long distance hiking like PCT sections, it is easy to fall into the miles per hour trap. I need a reboot. Bring it, winter. Any new winter things you plan to try? Do you take a break from a certain activity seasonally? Around here, when people say "it's going to be a bad winter", they mean a winter without snow. Not only are there lots of skiers here, but we know what the fires of summer can bring. So far? It's hard to tell. It's been cold, so cold that sometimes the gym seemed a better option. Being a bike wimp, I stop riding when it's below 30 F. It's time to retool for winter. I live in a 1,000 square foot house with one closet. Why it's so challenging to find things in it, I don't know. Winter caught me by surprise. Where are the gaiters? Microspikes? Oh, I guess I need my snowshoe boots--running shoes don't cut it anymore for hikes. Though there's not quite enough snow to ski yet, it is coming, and I have no idea where the ski wax is. The dog needs her own wax, a concoction called Mushers Secret that is supposed to stop snow accumulating on her fluffy paws. 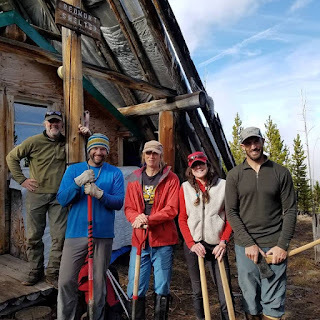 Over Thanksgiving, some visiting friends and I hiked up the backside of Mount Howard (8000'). However, as is typical with a larger group, we didn't get going until nearly two pm, which left us little choice but to only hike a couple miles and turn around. So a couple days later I decided to take on the climb again. This hike is one I do every year and forget how steep it is until I am back on it. Conditions vary wildly from packed snow to ice to knee deep unconsolidated powder (today's conditions). You never know what you are going to get. I started out with a fat biker, who eventually got tired of hike a bike and turned around. I continued on solo, slogging uphill and thinking that if I wanted to turn around, I could. However. I feel like people need to be comfortable with being uncomfortable. Plowing through deep snow at a slow rate of speed, going uphill steeply, isn't easy. But there's a line we all have, the "turn around" line. I'm not talking about the danger line, which we have as well. This is the "I call BS on this expedition" line. It's good to push that line every once in a while. So I did, at the blazing speed of less than two miles an hour (just a guess, since having a Garmin would be too demoralizing and annoying). Finally I reached the sunshine, which perked me up considerably. After that it was just a slow knee-deep push to the summit. Nobody was around, which isn't unusual. This is a tough one to sell people on, despite the reward at the top. Gondola summit building. The tram only runs in summer. As is often the case, it was warmer up there, and rows of mountains stretched to the horizon. It was worth the slog. It always is. Unless it's not, which is a whole other story. Total distance: 8 miles, but it seems like farther. Elevation gain somewhere in the 4000s. I had walked sixteen miles, losing five thousand feet and then gaining a thousand right back. It would be dark soon. It was time to stop. I had tried to stop earlier, in Sumner Wash, on a picture-perfect ledge below a couple of rare water-filled potholes. But when I set up my tent, the wind bent the poles and pushed the fabric to the ground. I had pressed on, hoping for a windless spot. Now it was time for a Desperation Camp. I've had a few of these Desperation Camps, a last minute scramble to beat time or weather, sometimes spent holding a tent pole in despair, other times sleeping sideways in the only halfway decent flattish spot around. This one, among the sagebrush and cactus in the Clear Creek use area of the Grand Canyon, hardly qualified as desperate in the end. Parked below Zoraster Temple, looking across the great expanse of the Tonto platform, with the kind of stars you only see in a place where there is complete darkness--even with a little wind, this was not a true Desperation Camp. I was back in the Grand Canyon, because I can't seem to stay away. I asked about ten people to go along, but they all were constrained by obligation or time, so I was doing this one solo. I had never been to Clear Creek, which is an easy climb from Phantom Ranch, and so I had chosen this area for two days. During those two days, I didn't see a single person. In the Grand Canyon! Unbelievable. The next morning I descended a slippery scree trail to the creek, which was a little slice of paradise. Campsites were nestled in the sand below high rock walls. It was only ten in the morning, and I contemplated tagging it and heading back to a dry camp closer to the Ranch. It's hard to turn off the voice that says I should constantly be moving, but I managed to do it. I sat on a sandy beach by the creek. I explored a little downstream. I wrote a little. The hours passed quickly. The most delightful campsite. The large rockpile, obviously meant to block the wind, gave me pause, but it was calm and warm here. Total solitude in the GC. With a sigh I packed up to head for the controlled chaos that was Bright Angel Campground. It's hard to avoid a stay here if you go to Clear Creek--it's nine miles back from the creek, and usually you won't want to start hiking out of the canyon at that point, though it is certainly doable. I snagged a campsite by the creek and trooped off to Boat Beach, one of my most favorite places in the universe. I can work with this. And look, new fancy boxes to replace those ammo cans that people could never figure out how to open and would bang them around all night long. Nobody is at Boat Beach! The problem with Bright Angel, and its cousin farther up the trail, Indian Garden, is that the NPS likes to concentrate its campers. This means a parade of people traipsing by your campsite to get to the bathroom. It can mean people who sit around their picnic table with bright lights and loud voices. This time, most seemed beaten down from the descent and few even ventured to the cantina when it opened to us peasants at eight. The cottonwoods are just starting to turn. Campground on the right. The last night, I climbed to the Tonto platform and reluctantly stayed at Indian Garden. The Corridor is getting much too crowded for my liking, but IG serves a purpose. From there, you can wander along the Tonto trail to the west, places where most people never go. And the true beauty of IG is that you can leave well before sunrise, travel for an hour by headlamp, the only person on the trail. Then you can watch as daylight slowly comes to the canyon. Whenever I climb out of the Canyon--and this has been my tenth trip below the rim--I debate about going back. I've done a lot of the trails, and the ones left are the scary steep or are waterless for 30 miles. Really, there are other places to go. But in the end, I leave making plans to return. It's just that magical. I ran along the unexpectedly snowy trail, Ruby in tow. I love this brief time of year before the trails get too deep to run, but when nobody is on them. The trails become mine again, not shared with a plethora of tourists. Lately I've been suffering some random pains when I run, but today was the stuff of dreams. I didn't stumble, nothing hurt, and the last light was showing on Sacajawea. I've been running since I was fourteen, and while I don't run as often or as far and certainly not as fast as when seven minute miles constituted training runs, there are still days like this, and I am grateful. Perhaps that's why I did something dumb. I didn't realize it until I was halfway done, not all that far into the trail, but far enough. No other cars were at the trailhead. The sun was setting, and an intense cold was settling in. I hadn't brought any survival gear. I had my phone tucked away in a pocket for pictures, but there's no service. I had on only tights, a long-sleeved shirt and a light jacket, OK for running but not if something happened. I've never been one to not think about consequences. As a wilderness ranger, I carried enough people out on stretchers to know that a misstep can be fatal. My day pack back then was so large that people thought it was an overnight pack (to be fair, our radios were enormous things and we had to be prepared to help others out with extra gear). And lately there have been more instances of mishaps on trails that become cautionary tales. Ruby and I successfully reached the trailhead and drove home to a glowering husband. "I didn't even know where you were! It was dark!" Oops. Note to self: leave a note too. I don't push my books on this site because I don't think that is what you come here for (if interested, visit here. But just in case you are in the market for an outdoors book or two, I am selling them for a reduced price. $15 includes shipping, a screaming deal and a way to benefit a writer rather than a big store (although, please visit independent bookstores). Fire in the Heart, a memoir about fighting wildfires as the second generation of women to do so (late 1980s/early 1990s), and how land is shaped by fire and vice versa. $15 shipped media mail. Ha ha. Anyway, if you love to read, or if you know someone who does, and want a book for a cheaper price than you can get anywhere, email me at maryellenemerick DOT com. Only while supplies last. BACK TO REGULAR PROGRAMMING! By the way, thanks for the recommendations on indoor hobbies. I definitely will consider them all. The harmonica was genius. Prepare to be annoyed, neighbors! Do you have a side hustle? Post it in the comments so we all can support it. Jill, I'm looking at you (and everyone else). I want to discover some new stuff! "I'm going to the post office to pick up the shrimp" is a phrase I never thought I would utter. 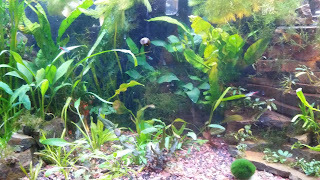 Neither did I think I would sit transfixed in front of an aquarium, watching fish swim around. Why am I telling you about fish tanks? Because I want to dwell on the importance of having a few indoor hobbies. But I'm an outdoors person! you may argue. However, I find that on the dreariest of dark days, I need something to do rather than eat brownies sit around inside wishing it were summer. Also, I remember years ago in a small trailer in the middle of the Florida swamp, sidelined by a running injury, I paced and whined until my co-worker Mike got fed up. "Don't you have ANY HOBBIES?" he asked in frustration. No, no I didn't. Mostly I just ran. Of course, I read books, but I don't think of reading as a hobby--it's more an essential element of life, like breathing. Was I getting boring, I asked myself? Should I take up knitting? Help me out here. There's got to be some indoor hobbies that don't require any talent. Something to do over a long winter. I can't look at shrimp all night! OR CAN I? I gripped the maul and eyed the round balefully. Usually splitting wood comes pretty easily to me; I've had lots of practice. But these rounds had been sitting in the fall rain for some time, and were spongy and unyielding. No need to lift weights today, I thought. To top it off, a torrential rain beat down on my head. And it was my own fault. I had split a few rounds here and there during the summer, but on sunny, warm weekends, who wanted to do chores? Not me. Putting it off until nearly November meant that the snow was soon to fall (in fact, some was forecasted the following week). I had no choice. People sometimes look at my many hiking adventures and express admiration that I can get out so much with a full-time job. What they don't see is that I make choices, and one of them can be neglecting chores. I choose not to have a spotless house, for example. And I end up doing the needed chores at times that aren't quite optimum. Unlike my neighbors T&T, I don't have nicely sorted by size pieces of wood stacked and ready to go by the end of the summer. In fact, I can be sometimes found chopping kindling at dawn during a snowstorm. Sorry, late sleeping neighbors! Humblebrag, I split all of the wood in this photo. So this weekend wasn't one of beautiful trail runs or hikes. Instead it was..chores. On Saturday I joined a work party to do maintenance at the backcountry ski hut. It wasn't really my idea of a good time to chop MORE wood, and I'm not even a backcountry skier, but the company was good, and we heard wolves howling in close proximity, so that was cool. I feel like if you use the trails or the amenities, you should give back to them. If you can't physically do trail work, you can donate money to trail maintenance organizations. I've heard people say that our taxes should pay for clear trails. Well, they should. But they don't. I won't go into the tiny budgets for trails that agencies get. So to sum it up, into every life a few chores must fall. And I'd write more, but the wood is calling. Well, as it turns out, hiking 17, 27, 12, 28 and 26 miles in a row when you haven't been doing that on the regular makes you pretty tired for a few days afterward. I took two full days off from exercise, feeling a little slothful, but reminding myself that I had essentially backpacked a marathon three days in one week. But the warm October weather drew me out. When my friend R suggested a hike, I selfishly suggested a flatter one. We hiked ten miles on the Hurricane Creek trail, which is not epic. I tend to avoid it in the summer, because it is where everybody goes. Close to town, relatively flat, and beautiful, what's not to love? But in October, the people are fewer. You can even go for a trail run without passing a horde of people. You can let your dogs run free without disapproving looks (there's no leash law here, but some people don't like dogs). The larches have turned the color of sunlight. Golden aspen leaves litter the trail. It was easy walking. We paused at the five mile turn around, eyeing the sign to Echo Lake. Only another three miles! So tempting. But I knew that it wasn't in the cards. Darkness falls early this time of year. And the trail is steep and rocky, not something I was up for. Next time, we agreed, knowing it would be many months before we would be back. I decided to go for a longer hike this weekend, the 16 mile round trip to Ice Lake and back. As I started to hike, I wasn't really feeling it. My legs felt like they weighed a million pounds, and I huffed and puffed up inclines that I usually spring up. I'd just go until the snowline, I thought. I had been told there was a foot of snow up high. But when I got to the snowline, I couldn't stop. It turned out it only took me about ten minutes longer than it usually does to get to the lake. And it was worth it. The winters are so long here. It's mid-October, and I won't be seeing Ice Lake again until at least the end of May. It's not a place to venture in winter--the threat of avalanches is too high. I felt a little sad, saying so long to the lake for several months. But, I was happy I had pushed through the malaise. I'm never sure if it's just laziness or something else that makes it hard some days. Erring on the side of laziness, I typically force myself to push through. A few intrepid backpackers were heading in as I headed down. Since all the campsites were covered in snow, it looked like a cold night for them. But just like me, they were seizing probably the last warm weekend (I'm not so sure about hiking in jeans in the snow though. Please don't do this). Maybe it's good that the trails close down in winter. I don't want to only have one hobby. Soon the snowshoes and skis will come out of hibernation. Even the ice skates could reappear. I'm planning my final PCT sections for this spring. It's time to let the mountains sleep. Hiking the Pacific Crest Trail, Ashland to Crater Lake: Section Elusive completed! I stood shivering at the intersection. The rain showed no signs of stopping. The trail from here on climbed two thousand feet, where it would likely be snowing. To my left, salvation in the form of Fish Lake Resort. To my right, the claim to be tough and continue. Oh the heck with it. I turned off to Fish Lake. Even though it was a holiday weekend, the weather was miserable. The dining room wasn't all that warm either, and the guy at the cash register didn't seem too excited about me spreading out dripping gear in there. But. There were two types of cabins available, the rustic one with cold running water and no heat, and the luxury one with heat. Of course I picked the one with heat, laying out all of my wet gear and watching it dry with satisfaction. I love you, Fish Lake Resort, and you saved me. But, I had to turn on the oven to get it remotely warm in the cabin. About your heat...I think you need to turn it up. I had been 90% sure I was going to quit. If it wasn't fun, why would I keep doing it? But when I texted my enabler, Beekeeper, for the weather, it looked like I had a window. Cold days, but clear. It was only 54 miles to the end. It looked possible. The next morning dawned cold and clear. I headed out, meeting a few southbounders along the way. All of them were thru hikers who had had to skip this section because of smoke or because they had flipped up to Canada to make sure they stayed ahead of the snow. All of them agreed: the last two days had been awful. The trail climbed steeply to a high point where the wind whipped mercilessly. Below me I could see a myriad of lakes: the Sky Lakes Wilderness. Sadly, the PCT stays high on a waterless ridge, missing the lakes entirely. At 27 miles, I was ready to camp, but the wind precluded that possibility. Gritting my teeth, I ground out another two miles to an exposed but windless viewpoint. Diving into my tent, I shivered for hours under my sleeping bag until I finally warmed up. It was too late to be out here, I realized. The next day I awoke to....rain. No! Looking at the map, I realized that if I pulled off another long day, 26 miles, I could make it to Crater Lake and be done, versus another night in a wet tent. I'm not usually one to cut a trip short, but I was over the cold weather and wet gear. It was time to call it. The trail stayed mercifully flattish, coming through the Blanket Fire of 2017. I had been on this fire, though I had been stuck at the helibase and didn't comprehend the devastation. Hardly anything had come back in the intervening year. The misty rain continued as if it would never stop. There is a Rim alternate trail that nearly every hiker takes. Why stay in the creepy woods when you can hike along the caldera? Unfortunately, the last mile I had to hike, reaching Rim Village, was straight up. I may have whimpered a bit as I crept upwards. After all, this was mile 26, after a 28 mile day yesterday. Turns out, maybe you should train a bit before you do that. And I don't mean just random trail running or occasional 16 mile hikes. However, not even the chilly wind and rain could dampen my enthusiasm as I stood on the rim, surrounded by a few hardy tourists. I had done it, finished the Oregon portion of the PCT! In many ways, this was the most mentally challenging section so far, save the snowy bail-out in the Sierra Pelona last year. 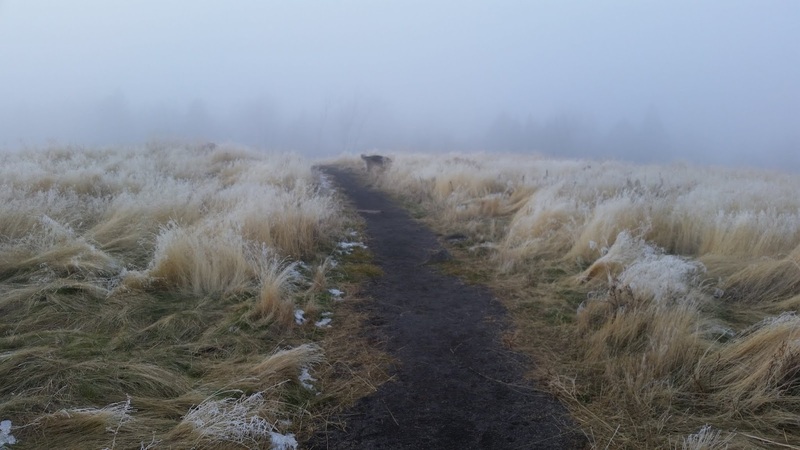 When I thought about it, safe and warm at my friends' house in Bend, I realized it was because of the trail being empty. There are some trails that I want to be empty, but part of what I like about the PCT is talking with other hikers, knowing they are experiencing the same conditions, knowing they are in love with the trail also. Hiking the PCT off season isn't for me; I like people too much (at least, this kind of people). Plus, there's too much pushing daylight. It got dark at 6;45 and didn't get light again for twelve hours. I'm not a fan of night hiking--what's the point? I want to see where I am hiking, and there are too many potential predators out then. Twelve hours in a small tent is a long, long time. It was with great satisfaction that I drove away from Section Elusive. It would have been easy to quit, and I almost had. Why I keep pursuing this PCT thing is sometimes beyond me. But now--with less than three hundred miles to go--I am going to see it through. The first hiker I had seen in two days was quitting. "I'm done!" he said, standing on Indian Memorial Highway. A pretty woman leaned out of the car, waiting to pick him up. We stood in the torrential rain, darkness closing in. "Do you need anything?" he asked. I contemplated this. I was soaked, my feet freezing. I had already hiked 25 miles, and I was pushing to make two more to reach a three-sided backcountry shelter so that I didn't have to set up my tent in the rain. It was tempting to get in their car, be whisked away to a town, and quit this foolish late season endeavor for good. What was I doing out here? The trail was virtually empty. The hiker had told me it was snowing above us. I had read enough missing hiker stories to know this wasn't a great situation. But still. This was my window. This section, which some of us had named Section Elusive, was nearly always on fire, choked with smoke, in snow, or filled with vicious mosquitoes. If I didn't hike this one hundred miles now, it felt like I never would. I forced a smile. "I'm good." I watched the car drive away. Had I made a huge mistake, I wondered as I dashed through spooky woods to reach the shelter. Inside, I gratefully rolled out my sleeping bag and clicked on my headlamp to reveal a large rat eyeing me hopefully. But in the contest between hypothermia and a rat, the rat won out. The section had started out the day before in warm weather, passing near Ashland through tawny grasses and views of Pilot Rock. My only pause was when I happened upon a dead deer in the trail. No apparent wounds showed a cause of death, but I spotted mountain lion tracks further up the trail. Glad now that I had brought my heavy can of pepper spray, I hurried on. Making 17 miles before dark, I hastily threw up my tent and crawled in. Twelve hours of darkness awaited. The next day the rain began. At first it was just a light mist, and I happily whipped out my trekking umbrella. I hadn't used it before, not sold on it, and it became apparent that the lashing mechanism I had hoped would tie it securely to the pack wasn't going to work. I sighed, collapsing my poles and holding the umbrella with one hand. At first I congratulated myself for bringing this nine ounce item. I didn't even have to wear rain gear! But reality set in. Umbrellas are great in light rain but in heavy downpour what is sticking out--arms and legs--are going to get wet. Just a little less wet. Sharing a shelter with a rat was a new low, but it turned out to be the right move. It was still raining heavily the next morning, and I thought about just staying there, waiting it out. But there was no guarantee the rain would stop. It had been forecasted to last only one day, but obviously someone had gotten it wrong. With a sigh I shoved my feet into wet shoes and headed out. Someone left this book with many pages of a continuing story. Hikers had added to it as the summer went on. These were the absolute worst conditions for hypothermia: forty degrees, a wind, and rain. I sloshed along in misery. Why was I doing this? What drives me to complete this darn trail? After ten miles I came to an intersection. Two miles downhill lay potential salvation--Fish Lake Resort. Ahead lay more miles of rain-soaked trail, the trail now a river, deep, deep puddles. Which would I choose? And if I did go to Fish Lake, would I quit right there? I thought about it. Maybe this section Elusive wasn't meant to be hiked. I could quit gracefully and just go home. I stood there for a minute, deciding.